2-room apartment, fully furnished 130 m2 in an exclusive and modern residential building located opposite recent 5 hole at the Golf Course 18 holes of the Marlins in the prestigious Metro Country Club of Juan Dolio. In order to complete the golf course, garden area and playground and partial to the pool. Equipped with combi-refrigerator, washer-dryer, stove, microwave, extractor, blender, toaster, coffee makers, Hairdryer , iron, Internet, Sound system, TV and cable TV. System insulating Climalit and roller shutters on the windows and doors. Flats in imported porcelain. Gateway to high security. Modular kitchen finished in mahogany, in black granite ceilings, central air conditioning, Ceiling Fans, water heater, common bath with shower, bath main jacuzzy. 1 lit King size beds and queen size 2. Linen included. 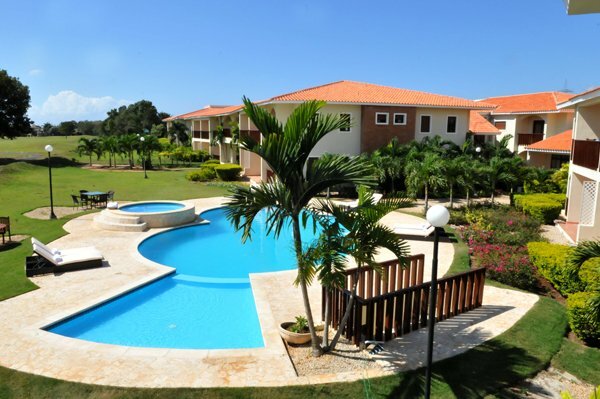 Among the amenities of residential, is the social area with pool, Jacuzzi and childrens area. Right to 1 parking space. GIFT: 5% bonus for future bookings. Metro Country Club offers the golf course that hugs the Marlins entire project, creating a wonderful atmosphere of peace and serenity. Residents, owners and partners enjoy the following amenities: golf course, the Marlins 18-hole par 72, Driving range. Club House Restaurant 19th Hole Bar, Cigar Lounge and Piano Bar, Terrace Bar in the pool area, pool and Jacuzzi, lighted tennis courts, childrens play area, Pro Shop, locker area, Mini-Market , mini golf 18 holes. The closest facilities are located: 30 minutes from the capital, Santo Domingo. Airport of the Americas at 20 , Medical Center, shopping, dining and entertainment area and 1.5 km beach.